SafariPasswordDecryptor: Apple Safari Password Recovery Tool. 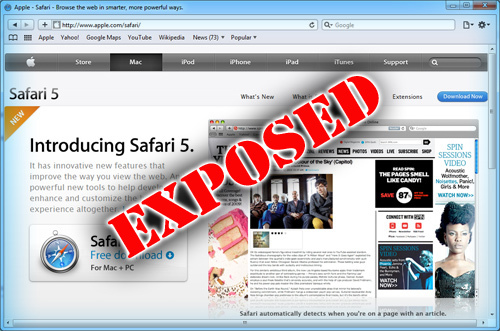 Safari is one of the top 5 browsers known for its innovative look and feel reflected in every product of Apple! It offers one of the best ways to read online, greater support for HTML5, and other new features that make the web even better. Like other browsers, Safari also comes with built-in password manager feature for securely storing and managing the user's web login passwords. This article is set to expose - in first ever public disclosure - password secrets of Safari including the stored password location, encryption algorithm and code for decryption of stored passwords ! Safari features good password manager with better security model and encryption algorithms to keep it as much as secure as possible. Unlike other browsers such as Firefox, Chrome, you cannot see the stored passwords in Safari. You can enable or disable the Safari password manager by toggling the option through "Settings -> AutoFill -> Usernames & Passwords" (as shown below). Once enabled Safari will prompt to save the password for every website login for the user. Upon confirmation, website URL along with username & password are saved to secret password file. Decoding the Safari 'Keychain' Secrets ! Looking at above 'keychain file' content, there is hardly anything you can make out. Only hint that you get here is the 'bplist' keyword at the beginning of file. 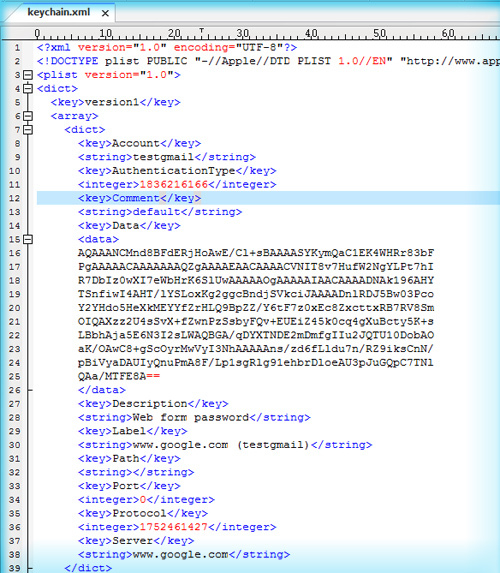 plutil.exe -convert xml1 -s -o c:\keychain.xml "c:\users\administrator\appdata\roaming\apple computer\preferences\keychain.plist"
The generated XML file (as shown above) contains encrypted password data along with website URL and username information. This stored password data is encoded using BASE64 algorithm. Note that original password data stored in 'keychain.plist' file is not encoded with BASE64. When we convert it to XML using Plutil tool, the encrypted password data is further encoded with BASE64 format. Once you decode the password using BASE64 you will see original encrypted password data. Safari uses standard 'Windows Data Protection' mechanism (DPAPI) [Reference 2] to encrypt the password data with user isolation layer. Windows DPAPI provides functions like CryptProtectData/CryptUnprotectData for easy encryption/decryption of user oriented sensitive data such as passwords. Safari uses CryptProtectData [Reference 3] along with static entropy (salt) to securely encrypt all website login passwords. Finally it is stored in the 'keychain.plist' file with other user login information. First you have to use standard Base64 decoder algorithm [Reference 5] to get original password data from encoded password bytes in XML file. Initially salt generation algorithm appeared to be dynamic but after few reversing session on different systems my doubts cleared and it was just static data. Salt data is of 144 byte size and ends with standard signature pattern as 'com.apple.Safari' as shown in the above screenshot. Above program initializes the salt data and then passes it to CryptUnprotectData along with decoded password data to finally get the decrypted data. 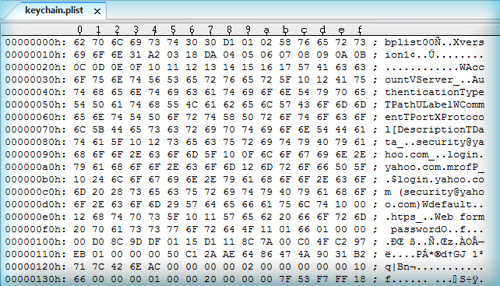 First 4 bytes of this decrypted data contains length of the ascii password and then follows the password in clear text ! That is all it takes to successfully decrypt the Password from Safari store ! 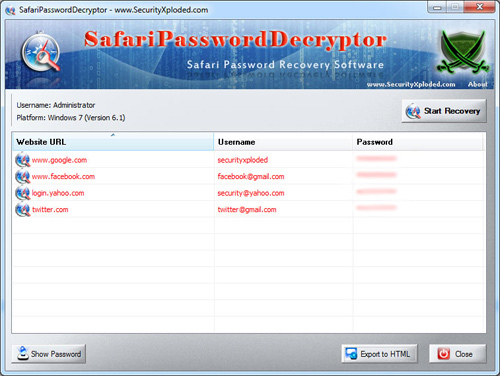 SafariPasswordDecryptor [Reference 6] is the FREE software to automatically recover website login passwords stored by Safari web browser. It helps in instantly decoding and decrypting all the stored website login passwords from Safari Keychain file. SafariPasswordDecryptor works on most of the Windows platforms starting from Windows XP to latest operating system, Windows 7.